Chocolate cravings are real peeps! And that’s why I almost always make sure to have a couple of these chocolate truffles in my fridge or freezer. 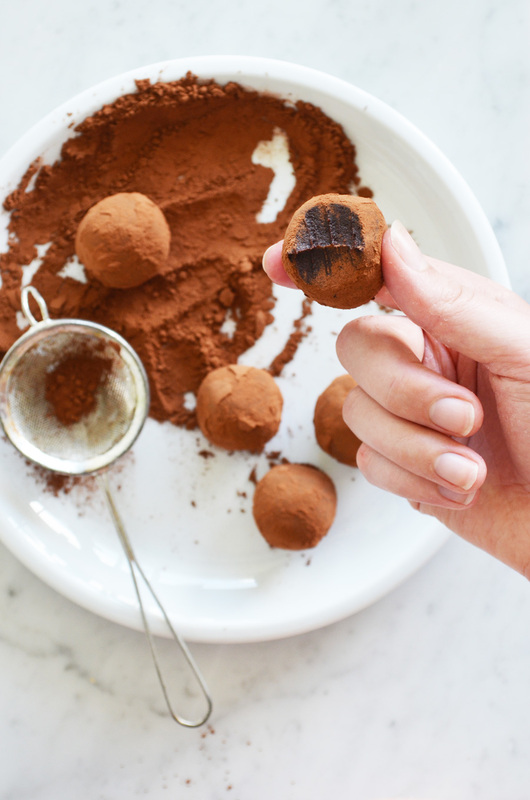 Even straight out of the freezer these are delicious, so these are perfect to make ahead for when that sudden chocolate craving hits you. You’ll only need three ingredients, put it all in a blender or food processor and then just roll them into balls. Easy peasy! I’m not claiming these truffles are “super healthy” or anything, because they still contain 11.9 gram of sugar per truffle. Even though the sugar is coming from dates and not from refined sugar, sugar = sugar and too much sugar is never good. 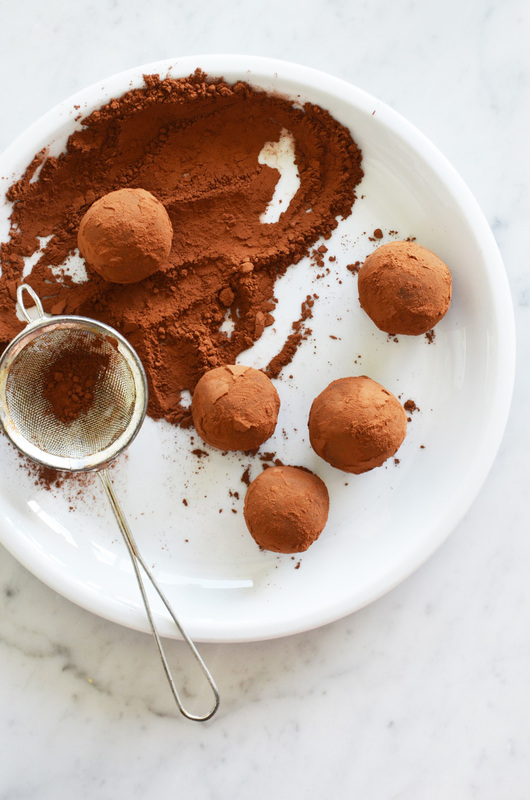 However, the fat content of these is only 3.6 gram, which is really little compared to traditional chocolate truffles, which can have up to 26 gram of fat per truffle! Furthermore, these are made with only three wholesome ingredients, which means no nasty additives and they are suitable for all of your vegan/gluten-free/refined sugar-free friends (except those with a nut allergy of course). 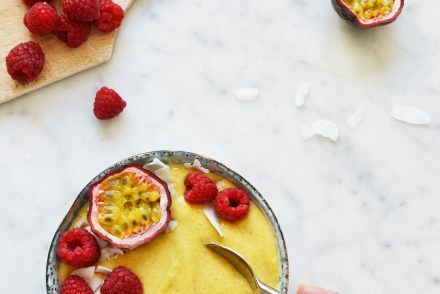 Of course, mental health and wellbeing is also important, so if you’re really craving something sweet and indulgent, treat yourself to one of these once in a while 😉 You won’t regret it! Control whether or not all pits are removed from the dates. If you’re using hazelnut butter, add the dates to your food processor and blend until a thick paste has formed. If you’re using whole hazelnuts, put those in your food processor first and blend until the hazelnuts have turned into a nut butter. Add the remaining ingredients to the foodprocessor (cacao powder and dates or hazelnutbutter) and blend until a thick dough has formed, but there are no lumps left. 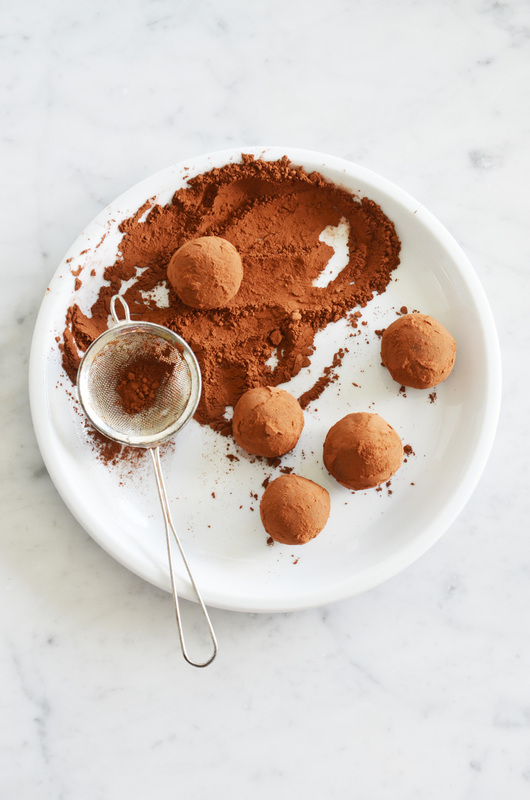 Form 6 truffles from the dough and roll them in cacao powder. Store in the fridge or freezer.